The Improv Hootenanny series from the Ivy Room may be gone, but we recently had a “Hootennany Revival” at Berkeley Arts. Lucio Menagon, who started the Ivy Room series, was back in the Bay Area and joined by Suki O’kane and other familiar faces along with new participants. The musical (and visual) artistry is of course the center of the Hootenanny experience, but drinks and lively conversation are also a key part, and there was plenty of these before the formal part of the program began. The performance opened with a solo set by Henry Plotnik, perhaps the youngest participant I have seen in any of these Bay Area improv events. He made use of the venue’s acoustic grand piano in addition to his electronic keyboard, and effortlessly weaved a set that moved between tonal and inharmonic elements. 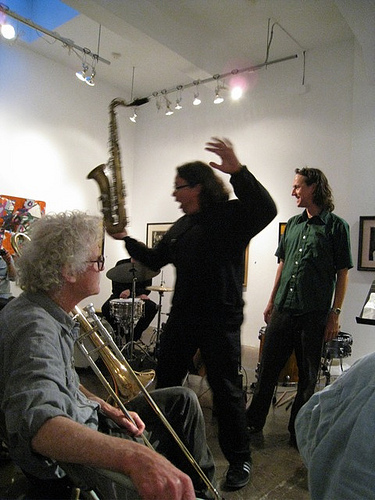 Plotnik was followed by a duo featuring veteran improvisers Philip Greenlief and Ross Hammond, on saxophone and guitar, respectively. Their performance had a sparse but intricate texture, frequency bouncing odd melodic lines or noisy extended techniques between them. The evening also featured a version of Lucio Menagon’s Strangelet project, with familiar members Suki O’kane on percussion and John Hanes on electronics as well as a relative newcomer to the Bay Area scene Stephanie Lak. Lak’s contribution contrasted physically and sonically with the other members of the group, who provided the steadily evolving cloud of improvised sounds I remember from previous Strangelet performances. She was completely mobile with a pair of toy megaphones and tiny amplifiers and moved around the stage area freely with bursts of vocal and electronic sounds that floated on top of existing soundscape. The TreeJay OctoPlayer, a project of Thad Povey and Mark Taylor, featured eight independently controllable platters and styli for vinyl records. During their mini-sets, the performers switched among different records and changed speeds to create a rich and somewhat eerie musical collage. It was also fun to watch the process of working with this towering instrument. The final set featured Stanosaur with guitar and a wall of large amplifiers. Basically, he played long heavily distorted drones that drove all of the amps to create different beating and phasing effects at rather high volumes. And by “high volumes” I mean ear-splittingly loud! Fortunately, I had my ear protection, and earplugs were made available to the audience. But it was still an intense experience to hear and to feel the effect of this sound, and a fog machine and lasers added a visual element. In all, it was a fun night of friends and good music, which is something to be valued. I hope we can start another regular improvisation series in the Bay Area with the same degree of casual fellowship and quality musicianship. Today we look back at two Reconnaissance Fly performances in early January. The first was a return to Luna’s Cafe in Sacramento, and the second was at Revolution Cafe in West Oakland. By coincidence, we shared the bill on both nights with guitarist Luke Westbrook who was visiting from New York. 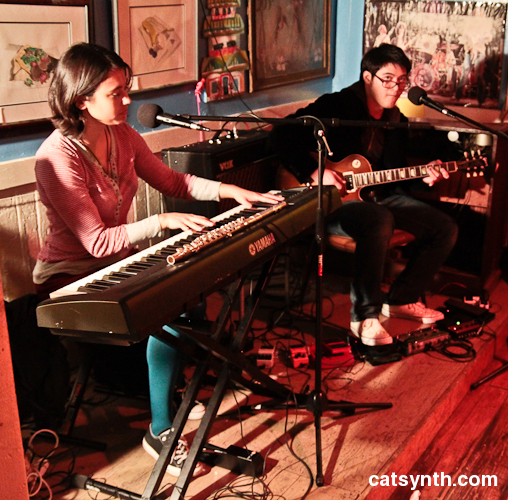 This was Reconnaissance Fly’s third gig at Luna’s – we like playing there and not just because it shares my cat’s name. But the stage was once again a bit cozy for a band of our size, even more so now that we have a fifth member, Chris Broderick on reeds (saxophone, clarinet, bass clarinet). This was our first public performance with the new quintet lineup. So it was a bit of puzzle trying to get the bass, drums, keyboard and bass flute on the stage, and still find room for the people who play them. But somehow we managed. Our set went well – at least, I was pretty happy with it. Our opening graphical score improvisation piece Small Chinese Gong went off without a hitch. As Neat As Wax is becoming our most consistently well-played song, as it is not too difficult and it is quite lyrical and rhythmic. Electric Rock Like a Cat and Sanse Iz Crede Nza are our most difficult, but also the most energetic and got a great response from the small but enthusiastic audience when we hit the final notes. After striking the stage, it was time to relax with beer and guacamole and other treats and enjoy the next sets. Luke Westbrook took the stage for a solo guitar performance. He has a very intense stage presence and a virtuosic technique, but the music itself has a certain ease to it. It began with gentle arpeggios that had a consistency even as they were constantly changing. These evolved into more defined repeated phrases over time that were occasionally punctuated by the occasional chromatic tone or blues-like bend. Later on, the music become more distorted with noisier and more percussive elements. There was a passage of single repeated tones that provided an increasingly anxious vibe before settling down again. Westbrook was followed by Philip Greenlief and Jorrit Dykstra on saxophones with Tim Perkis on electronics. On the things I look for in electro-acoustic combos is how well the electronic and acoustic parts blend. In the case of this trio, they blended quite seamlessly from the start with long tones of subtly different intonation. The music soon became more animated, with syncopated saxophone rhythms set against low gurgly electronic sounds. There were many humorous moments with matching squeaks and bleats, and richly textured moments with multiphonics against electronic pads. Perhaps the most amazing moment of the entire set was a long virtuoso noise solo by Dykstra. It is hard to describe in text, but it was one of the most impressive saxophone performances I have heard in a while. 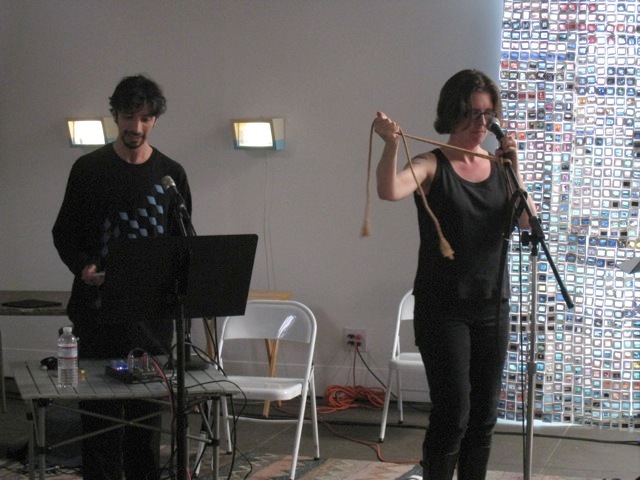 The later sections of the performance featured more percussive saxophone sounds, key clicks and striking of the metal hardware set against contrasting electronics with vocal and wah-wah effects. Revolution Cafe is located deep in West Oakland, not far from the rebuilt I-880 freeway, which makes for an interesting exterior environment. The interior is something altogether different, with every surface adorned with vintage and eclectic artifacts. 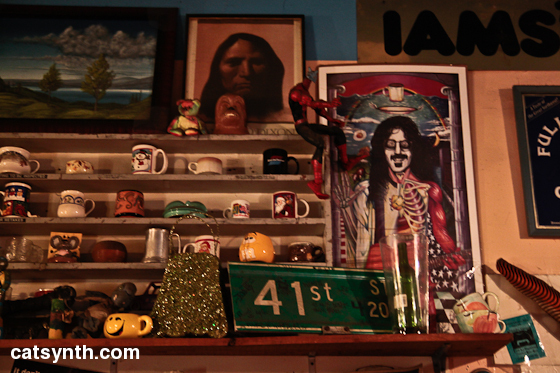 There were street and highway signs, political posters (from old Oakland Mayoral elections to the most recent Jean Quan recall announcements), vintage keyboard instruments, strange dolls and even a shrine of sorts of Frank Zappa. I spent quite a bit of time just photographing the space before even considering the music. The show was actually the latest incarnation of Karl Evanglista’s Light A Fire series. 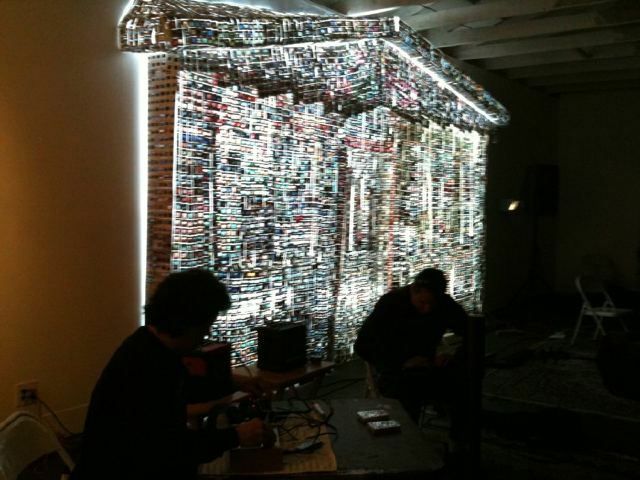 I had performed in this series last year with solo electronics. This even opened with another solo guitar set by Luke Westbrook. Westbook’s performance was actually quite different from the one he did two night’s earlier. While his technique was on display both nights, this one was more virtuosic and more diverse in terms of material and sound. This performance was mesmerizing. I had a sense of warmer colors as he played, though that may have been a kinesthetic combination of the cafe’s ambience and Westbrook’s harmonies. Next up was Grex, the duo of Karl Evangelista on guitar and Rei Scampavia on keyboard, voice and flute. Their music covered quite a bit of range, some more song-like with voice, keyboard and guitar, some closer to free-jazz with fast-moving improvised lines. One memorable moment featured featured a mellow guitar solo – Evangelista is quite a versatile guitarist – that morphed into in a driving loop pattern with distortion that produced its own harmony. I believe at least some of the material was from Grex’s recently release CD. You can follow the link above to find out more info. Finally, it was our turn to take the stage. I had toyed with the idea of using the Cafe’s B3 for An Empty Rectangle, but in the end decided it would have been a lot of effort, especially with a stage that seemed to be even smaller than Luna’s Cafe We had a lot of fun and played with a lot of energy that matched the intensity of Revolution Cafe’s decor. It didn’t feel as tight or accurate as we would want for a Reconnaissance Fly set, but it did have the humor that has become part of our band’s character. Today we look back at a concert of works by Polly Moller at Trinity Chapel in Berkeley, CA that I attended back in December. This concert was a large undertaking, not only with a full night of music by a single composer, but a large cast of characters from the Bay Area new-music scene, as one might see at an event like the Skronkathon, but in this case all working towards a single purpose and vision. There were several pieces I was already familiar with from previous performances, including two that I have performed myself. Three others were being premiered. Mythology and narrative seemed to permeate all of the pieces, whether drawn from specific mythological stories or unfolding through rituals and rule-based processes. The concert opened with a performance of The Flip Quartet. I had first seen it performed at Hypnogogia at the Climate Theater in 2009, and then had the opportunity to participate in a performance myself later the same year. This performance brought back the original lineup of Karl Evangelista, Jason Hoopes, Thomas Scandura and Bill Wolter. Four stations were set up, representing the four cardinal directions and the traditional elements of air, water, fire and earth. At each station was an array of instruments and other objects that in some way represented that element (e.g., wind instruments at the air station, electrical instruments at the fire station, etc.). 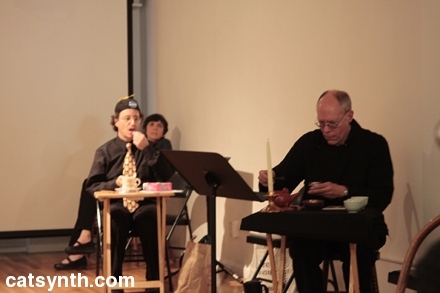 Each performer starts at a station and improvises using the objects for two minutes before advancing to the next and repeating the process. Musically, this can really go in many any number of directions (no pun intended) based on the particular objects available and the sensibilities of the performers involved. Often the sounds happen coincidentally, but every so often the four performers come together and produce that is musically integrated (@catsynth Lots of nice gurgling and drumming and whistling. Strong musical moment.) This was the first time I had seen the piece performed on a traditional proscenium. The previous performances were done in the round with the audience in the center and the stations surrounding them. While it was easier to see all the performers at once this way, there was something fun about the round format, the connection to the elemental and directional aspects and the ability to see the instruments close up. Next was the premier of Duo No. 1 featuring Gino Robair on a variety of instruments and Krystyna Bobrowski playing a “sliding speaker instrument.” The piece has a dual identity as a narrative following the life cycle of a moth and an excuse to make Gino Robair “play really, really quietly.” And indeed, it was relatively quiet and subtle, but still with a lot of dynamic energy. Robair played a variety of percussion instruments, including the signature broken cymbal that I often see him play. Robair’s sounds are fed into the speaker in Bobrowski’s instrument and excite the tube, which she can then vary in length to change the timbre of the sound. Bobrowski was able to get quite a variety of interesting timbres from her “acoustic signal processor”, which then informed how the improvisational duet unfolded within the context of the overall graphical score. The next piece, Penelope, was perhaps the most traditional of the evening, as it was through composed for a single performer on piccolo with supporting vocal and foot-stomping parts. It was commissioned for and performed by Amy Likar. After a brief intermission, the concert resumed with a performance of the Three of Swords. I had first seen Polly perform this piece for Pamela Z’s ROOM series at the Royce Gallery in San Francisco. This version was performed by Sara Elena Palmer using vocals and electronics. The narrative structure is a bit more abstract in this piece, but it is nonetheless present through the highly ritualized nature. The program notes describe it as a “sound-art divination ritual for solo performer and tarot cards.” It unfolds with the setting of a 20-minute hourglass and lighting a series of candles. For each candle, the performer draws a card from the tarot deck arrayed out in front of her, and interprets the card musically. (@catsynth http://yfrog.com/hsv2tzj pick a card any card.) At the end of each section, the corresponding candle is extinguished. Sara Elena Palmer’s bright red costume and head covering (which she removed during the recitation concerning the heart) seemed to be an integral part of her interpretation of the ritual. Among the more interesting musical elements she employed was a radio used to generate analog noise sounds. The next piece, Alcyone is based on the Greek legend of Alcyone, the Kingfisher Queen, who calms the ocean for seven days before and after the winter solstice so she can incubate her eggs in a nest on the waves. (Appropriately, this concert took place three days before the winter solstice.) Musically, the piece opens with an energetic instrumental quartet featuring Philip Greenlief on clarinet, Cory Wright on bass clarinet, Lisa Mezzacappa on contrabass and Suki O’Kane on percussion. After a stretch of time, mezzo-soprano Laura Malouf-Renning entered the stage regally costumed with a black cape and crown and carrying a nest with Christmas ornaments (@catsynth A festive birds nest). She silenced the instrumentalists one by one with a tap on the shoulder, and began an expressive monologue. The final piece of the evening was Genesis for 12 performers. I had first seen this piece at its premier at the Quickening Moon Concert last year, and then had the opportunity to perform it myself with Cardew Choir last summer. This version followed closely the personnel and interpretation of the original performance, featuring Polly as the conductor and Matt Davignon in the role of the new universe. The piece combines “Western magical tradition” with the concept of the 11-dimensional universe from string theory. The performers represent each of the dimensions, with special roles for the conductor, the timekeeper who represents the time axis, and three performers representing the conventional spatial dimensions. The final performer represents the new universe that is born from the multi-dimensional processes. The performers are arranged in a very specific spiral formation with the new universe (Davignon) at the center. The conductor (Moller) carries chimes and walks the spiral, tapping each performer to enter or exit. The sound starts out slowly and gradually, but then builds into a loud crescendo as the new universe is born. At this point, Davignon took over with a solo on live electronics. Like many of his other electronic performances, he achieves a very organic sound with lots of textural details, sometimes liquidy or like a series of objects being shaken or dropped. After the new universe solo, the spiral reverses as the other dimensions re-enter, but gradually get softer before a final statement by the new universe. As summer drew to a close, much of the Bay Area new music community gathered at 21 Grand for our annual ritual of live musical performance, socializing and tasty barbecued treats known as the Annual Transbay Skronkathon. The Skronkathon is also a benefit for the Transbay Creative Music Calendar, a free print publication that serves the creative music community here with event listings and articles (including several from this site). In fact, one of Tom’s live tweets described the duo of Ann O’Rourke and Carlos Jennings as “a disco remix of Berio’s Visage”. I am sorry I did not arrive earlier – it’s hard to pass up something with a description like that. Rachel Wood-Rome. Photo by Michael Zelner. Wood-Rome was followed by Respectable Citizen. Usually the duo of Bruce Bennet and Michael Zbyszynski, they were actually a trio on this occasion with the guest appearance of Jeff Ridenour on violone. For those not familiar with the violone, it is a large bowed stringed instrument with frets, closer to the viols used in Renaissance and baroque music than to the modern orchestral string family. The set started off softly with flute, picking on the violone, and stringy ethereal sounds. The next piece featured more noise and distortion, with scratching sounds on the violone and a particularly interesting moment with the keyboard resonated together with squeaking sounds from the saxophone. There was also a section of “loungy free jazz” – which is certainly fun for me – mixed with some FM-like sounds. Respectable Citizen was followed T.T.F.W.’z. If I had to describe their performance, it would be “punk skronking”, with loud, fast, driving rhythms and noisy squawks, squeaks and long strings of notes. And they had their own fan section doing 1990s-style jumping-up-and-down dancing. Given the loudness, I opted to enjoy their set from the alley, and even relive a bit of my youth by briefly demonstrating this form of dance to some of my musical colleagues. The next set was one I was quite looking forward to: a duo of Matt Davignon with “a table full of junk” (as Tom Duff delicately described it) and Eric Glick Rieman on prepared electric piano. I am quite fond of electric piano (e.g., Fender Rhodes) and interested in prepared acoustic piano, but this was first time I had seen and heard the two concepts together. The sounds of the Rieman’s instrument and Matt’s drum machines and effects ranged from high and tinny, to scratchy, glitchy, or sometimes more bell-like. The piano certainly made some unique sounds: boings. bell-like scratching and other effects that made the purely electronic sounds seem tame by comparison On occasion, the instrument’s piano-like quality would stand out, and one could hear the tines that are characteristic of electric pianos. At other times it was more aggressive and percussive. Rieman’s playing style brought out this quality, and I found myself watching the mechanics of the instrument as I was listening to the music. There was moment that seemed like film music, with long piano notes set against “squishy sounds” from Matt Davignon’s electronic effects. And then a sound that reminded me of marbles. There were anxious harmonies, and rhythms on top of rhythms in samples. Next up was blipvert (aka Will Northlich-Redmond). Standing behind a table with an Alesis Air and a Pioneer DJ controller, he launched into an intense and frenetic blast of music and choreography (@TomDuff He doesn’t *act* like a guy in cargo pants & a black teeshirt). The electronics were all controlled by his voice or other live sounds and gestures, so when he shouted or snapped or spun around or fell and the floor only to spring back up moments later, it would trigger a new sound or change in the sonic process. The hits and squeaks and thuds and sample loops and retro-1980s synthesizer sounds were perfectly timed to his over-the-top theatrics and choreography. It is clear that he spent a lot of time practicing and perfecting this. And it was definitely a fun performance to watch! Just when it seemed he was running out of energy and about to collapse from exhaustion, he got back up with a shout and launched into the next one. It is difficult to describe in words, but you can get a flavor from his videos from other performances. And the videos do not give the full sense of the energy. Blipvert was followed by Blowout Preventer (@TomDuff fresh from their gig at Deepwater Horizon), a clarinet quartet featuring Philip Greenlief, Dan Plonsey, Ceylan Yagmur and Michael Zelner. I am always intrigued by clarinet ensembles, having played the instrument in the past and written a piece for clarinet quartet. This performance began with whaling sounds that sounded like sirens, and then suddenly became quiet and harmonic and even contrapuntal. An intricate rhythm emerged in the sum of the four parts – even though each part seemed relatively simple, the interaction was complex. There was also a section with long growling tones, followed by more harmonic sounds; scraping of mouthpieces set against multiphonics; and a waltz that was interrupted. 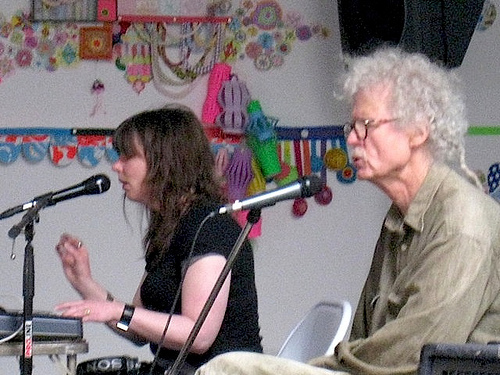 Next up was Kattt and Ron, a duo of Kattt Atchley on Ron Heglin on vocals with electronics. 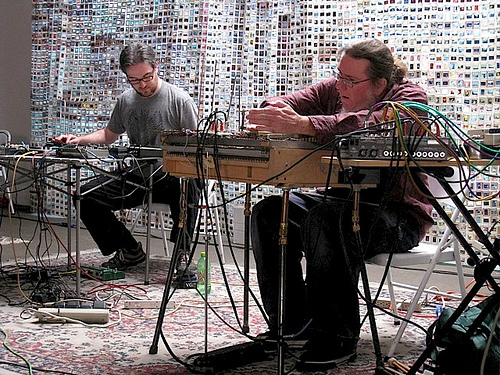 Their set began with long electronic drones with beating patterns. Heglin began his vocal incantations in this backdrop, with his words soft and purposefully hard to discern. The drone, which was slowly but continually changing, had a generally minor harmony, but with inharmonic tones and continued beating patterns. The overall effect was very meditative. There were some odd facial expressions as the vocals became more noisy. By this time, both Atchley and Heglin were performing with voice, gradually becoming more harmonic and moving between unisons and perfect intervals. I was able to hear the voices both as a single unit and as individuals, the male and female contrast. The sounds gradually faded to a single beating tone at the end with a sprinkle of more percussive vocalizations. As always happens at Skronkathon, I miss the set right before my own as I set up and prepare. In this, the set featured Bob Marsh on classical guitar, CJ Borosque on pedals an turntable, and Sandra Yolles on electronic percussion. It was then time for our performance. I recited the entirety of the spammogrified text (you can see a copy here), while Polly performed the refrain “as a dominate” as it appeared within the text, complete with props and choreography. It was interesting to both read (and hear) how my text was affected by the various translators and other processes that may have been used. Certain phrases kept popping out, such as “plum sonorous” and “plum decorous” – I think “plum” was the retranslated equivalent of “rather” or “quite”, which I often use in my writing. Soft instruments or musical passes were re-worded as “sissified”, and several people seemed to enjoy the phrase “sissified trombone” – and some people also had fun hearing their own names of those of their friends and colleagues appear in the middle of the barely comprehensible narrative. In terms of technology and instrumental accompaniment, I kept things rather sparse. I opted to only use the iPad, running the Smule Magic Piano and the a granular synthesis app called Curtis. As source material, I used some pre-recorded passes of myself reciting the text. We were followed by RTD3, with Doug Carrol on cello, Tom Nunn on his invented instruments, Ron Heglin on trombone and voice. They are always a fun group to watch. (@catsynth Scraping sounds percussive cello trombone and vocal blah blah. Some particularly interesting moments included all three instruments making percussive scraping sounds, Carrol performing the cello like a guitar and also upside-down, and a moment whether the tone of bowed cello and the skatch box and the two blended together. There were some very soft moments, such as soft staccato trombone tones, and a low drone-like rumble from the ensemble. There was also a series of sounds that conjured up the image of a scampering mouse. Next was a trio of Matt Ingalls on clarinet, Tom Scandura on percussion, and Thomas Dimuzio on Moog guitar. This was the first time I had heard a Moog guitar in a live performance setting. Knowing the musicians involved, I knew in advance this was going to be a loud set (@catsynth Scandura, Ingalls and Dimuzio trio will definitely not be sissified). The music started off with a dramatic film-like drone, with the clarinet coming though on top. The drums gradually got louder and started to match. From this point, there was mixture of fast runs and loud notes, some sections that sounded like 1960s free jazz and others that seemed to follow a more Middle Eastern scale. At some point, both the clarinet and the electronic guitar become more inharmonic and the drums got wilder and louder. Then suddenly a beat entered into the music, a bit of a slow rock shuffle or rock ballad overlaid with dark ambient guitar sounds. Matt Ingalls switched the violin at one point during the set. As the music started to feel more relaxed, it suddenly get loud again with FM-like sounds and acoustic drum, and then it got “super loud”. Even within the loudness, one could hear interesting details, such as a latin beat and a phrygian scale, and a really loud high-pitched squeak. The contrast to the next set, a duo of Philip Greenlief and David Boyce, was rather dramatic. Although it was full of fast virtuosic runs, it was relatively quiet and spacious. There were moments where the seemed to go into unison, or where the rhythm seemed to stand still, before returning to the fast and complex runs. There were also a variety of interesting breathing sounds, mouthpiece effects, and other extended techniques. At one point, it sounded like a bird or a creature that was “laughing”. The combination of the relative calm of the set and the time of the evening made this one that truly took advantage of the backdrop provided by Rubiolo’s artwork. 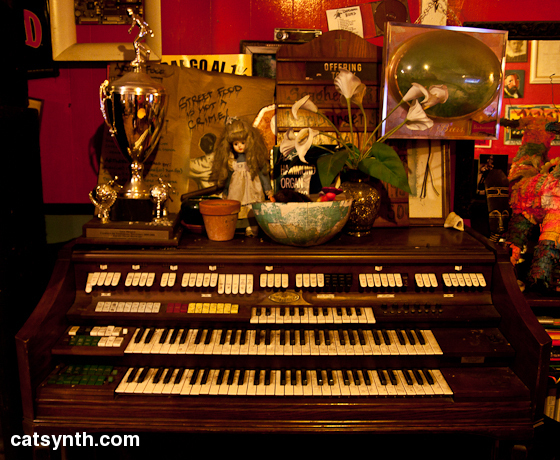 I featured this image of Greenlief and Boyce in front of it in a previous Wordless Wednesday. They were followed by another duo, Gino Robair and John Shiurba under the name G / J. Robair was billed as playing “voltage made painful”, and incorporated a Blippo Box, as well as a drum machine, effects boxes and a device for pre-recorded samples into the mix. Shiurba played guitar with a variety of extended techniques, including using a superball to excite the strings. The were lots of fast cuts and cartoonish moments, with boinks and slaps and machine noises. The Blippo Box had a liquidy organic sound that contrasted with finger-picking on the guitar. At one point in the performance, Robair set in motion a rather funky rhythm loop that sounded for a bit, then came in and out and decayed into grains of sound (@catsynth I want Gino to keep that funky rhythm background going longer. As a dominate.). There were moments that were a bit more aggressive, with loud piercing sounds, but then others that were…well, “plum sonorous” and featured minor harmonies. 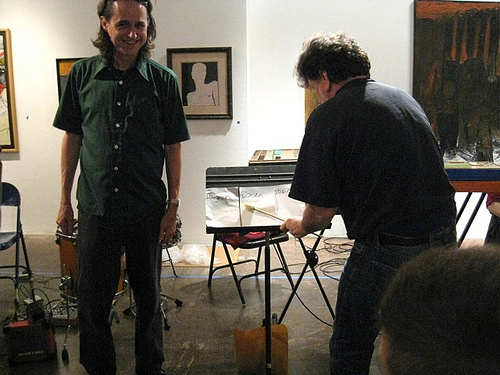 Next up was Wormses, a trio of Jacob Felix Heule (percussion), Tony Dryer (bass) and Bobby Adams (electronics). The set started with a low rumble and hum, with the bass soon coming on top of scratchy electronic sounds and Heule playing a cymbal against a bass drum. The music became more anxious and busy over time, with some electronic insect-like sounds coming in above the other parts. Then all of a sudden things got very soft. A rhythm emerged in the background, but barely audible behind the bass and cymbal. As the set continued, a walking bass line came out of nowhere, then lots of swells and glissandi. Gradually, the music built back up to a rather loud level, a couple sounds that were like clipping and feedback, and ultimately ending with the sounding of the bass drum. I think that was where I walked out to the alley for another break. There was lasagna! The final set featured Ghost in the House, with Karen Stackpole (percussion), Tom Nunn (invented musical instruments), David Michalak (lap-steel guitar) and Andrew Voigt (who was sitting in for Kyle Bruckman on winds). I had heard them previously at the Wind Moon Concert back in April, and their sound is quite ethereal and airy, even for the percussion and lap-steel guitar. As with the previous performance, they began with a procession, of elemental instruments. The room was dark, except for the light from the 35mm slides in front. The performers then took their places for the remainder of the performance. The sounds were quite subtle at times, slightly minor, and sometimes like old film or radio soundtracks with eerie wind sounds mixed in. The metal instruments (primarily Stackpole’s gongs on Nunn’s instruments) served as a foundation, with the sounds of the wind instruments floating above. In addition to the long atonal sounds, there were moments with high squeaks and east-Asian harmonies and timbres. In the final piece, Stackpole played on an interesting metal-tube instrument and also used a vinyl record as percussion. Michalak’s lap-steel guitar featured prominently in this piece as well. 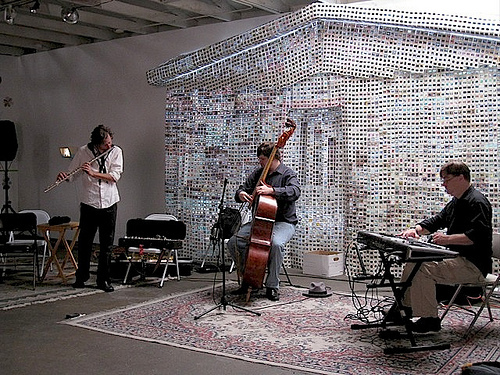 The overall effect sounded electronic, even though the ensemble was purely acoustic instruments. The night concluded with the ensembles recessional from the room, still appropriately dark. 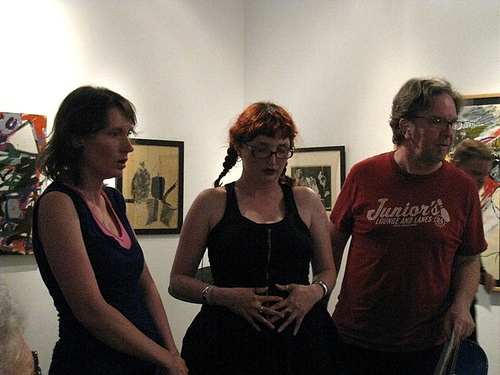 Last Thursday I attended and performed in the Tag Team Trio Shift at the Luggage Store Gallery. This event was part of the Eighth Annual Matthew Sperry Memorial Festival, a festival held every year in honor of local composer and bassist Matthew Sperry since his tragic death in 2003. 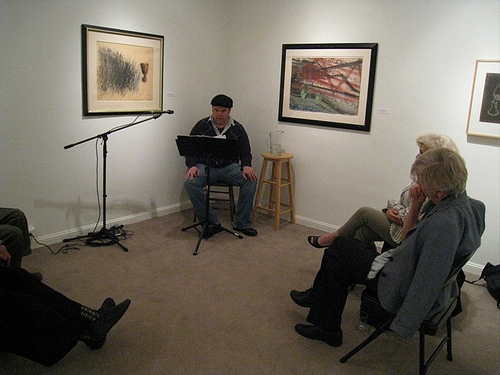 The event featured a large cast of characters from the Bay Area new music scene, improvising three at a time, with John Shiurba acting as referee. 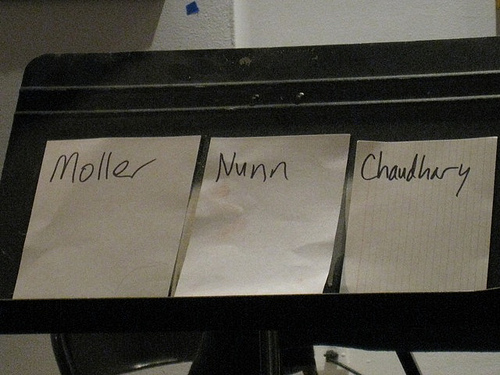 Each of us was given a name card. At any given moment, three musicians would be performing. Anyone could hand in their card at any time and replace one of the three current musicians. Thus, there was an ever changing set of trios. For the most part, musicians entered and exited individually, but in the second half of the program we could submit three cards at once as a planned trio. The music ranged from trios of synthesizers and electronic noise, to purely vocal trios, to free-jazz improvisation (saxophones and bass), and all combinations in between. There were many strategies one could use for deciding when to hand in his or her card and replace someone. For me, I timed my card to coincide with others with whom I wanted to play, or moments where I thought my sounds would work well with the texture. One could also be competitive and “cut” someone else’s improvisation (as one might do in a traditional jazz-improvisation setting). I can’t say that anyone did that, but there were certainly some playful back-and-forths with people replacing each other. There were some fun moments. One of Philip Greenlief’s improvisations involved his attempting to balance his saxophone in the palm of his hand, constantly moving and shifting in order to keep it from falling. He was clearly hoping for someone to replace him quickly, but we actually let him keep going for quite a while. The sounds from busy Market Street outside contributed to the music at various times – indeed, the street should have gotten its own card. Among the attendees were Matthew Sperry’s wife and daughter, who appropriately closed out the second set with the sound of shaking keys fading out. The full roster of participating musicians included: Myles Boisen, Amar Chaudhary, Matt Davignon, Tom Duff, Tom Djll, Phil Gelb, Lance Grabmiller, Philip Greenlief, Ron Heglin, Jacob Felix Heule, Ma++ Ingalls, Travis Johns, Aurora Josephson, Scott Looney, Bob Marsh, Lisa Mezzacappa, David Michalak, Polly Moller, Kjell Nordeson, Tom Nunn, Dan Plonsey, Garth Powell, Jon Raskin, Gino Robair, Tom Scandura, Damon Smith, Moe! Staiano, Agnes Szelag. 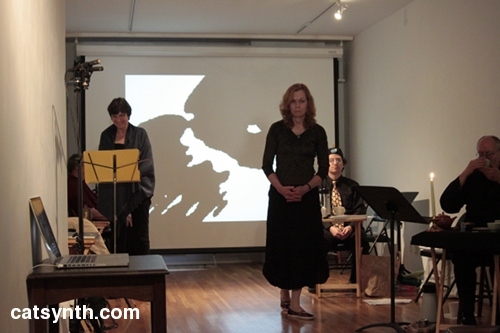 This past Sunday I attended resonant world: an afternoon of music by John Cage for the exibit The Visionary Art of Morris Graves at the Meridian Gallery here in San Francisco. Morris Graves was an influential artist in the 20th century, based primarily in the Pacific Northwest. The exhibition features about 50 works spread over several decades of his career and two floors of the gallery. Many of his works, which were mostly on paper, had a very simple quality, but often with some recognizable object or concept at its core. I was particularly drawn to a few of his works, including Minnow, Irish Animal, Waning Moon and Roadside Plants and Machine Age Noise. Graves’ work is often described as having Asian and mystical influences, which were apparent in Minnow and many others, but in works like Irish Animal a noticed a humorous quality, something approaching graphic art. John Cage became a longtime friend and admirer of Graves after the two met in 1935. He described Graves’ work as “Invitations”, or invitationals to attend to the ordinary details that are “ordinarily ignored”. Although the pieces in the program were not directly a response to Graves’ art, they do fit the spare nature of some of his works, and the focus on simple details, as well as the space of the gallery in which those works were presented. 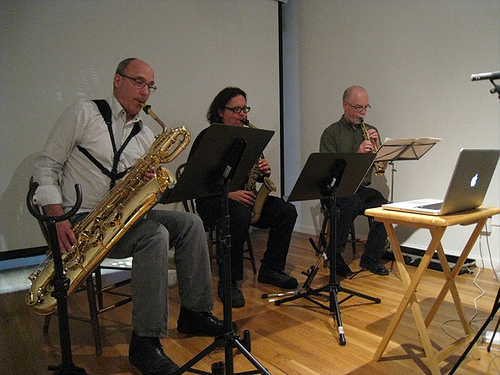 The first piece, Atlas Eclipticalis featured the saxophone trio of Philip Greenlief, Jon Raskin and Steve Adams. The title refers to the path of the Sun through the constellations of the zodiac, which Cage used as a source for the score of the piece, using tracing paper to determine the placement of dots and then adding a five-line music staff. The trio’s performance was derived entirely from this score. The result was a very sparse musical texture, with large areas of silence punctuated by individual isolated notes from each of the saxophones. There were also moments where the performers played together, forming interesting beating patterns as the simultaneous tones interacted with the room as well as perfect octaves and minor chords that were a bit startling (but quite effective) within the context of the whole piece. Atlas Eclipaticalis was followed by a performance of Three for “three players having a variety of recorders.” Conveniently, we happened to have three players who each had a variety of recorders, the Three Trapped Tigers (David Barnett and Tom Bickley with special guest Judy Linsenberg). 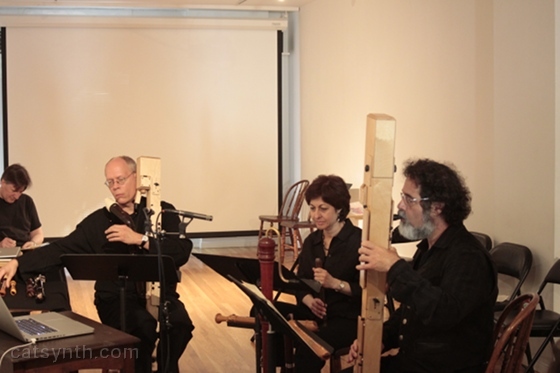 The recorders ranged in size from the familiar C soprano recorders and alto and tenor sizes seen in renaissance ensembles, to very “modernist” F contra-bass recorders composed of wooden rectangular sections with black buttons and levers – I am guessing these were Paetzold recorders. The piece unfolded as a series of chords – the timing of individual notes was left up to the performers – with frequent pauses and changes of instruments. The large number of recorders and frequent changes suggested a solo pipe organ performance as much as a wind ensemble. The final performance featured selections from Cage’s Song Books (Solos for Voice 3-92) interpreted by members of the Cornelius Cardew Choir. 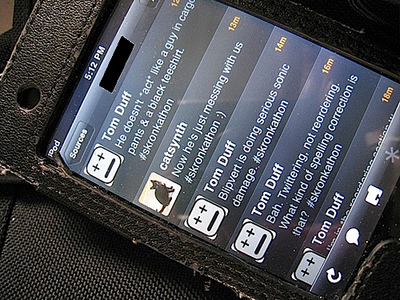 The songs derive from a variety of written sources, with some using graphical-score notation (a current favorite technique of mine) or text-based instructions. From these scores, performs are free to interpret and improvise their actual performances. Some of the songs were purely vocal and melodic, others were more theatrical, while others combined electronics with other elements. 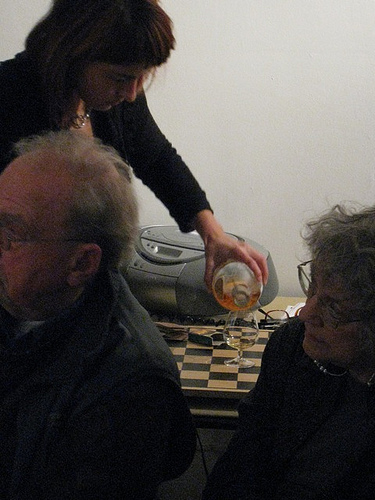 Among the moments that stood out were Tom Bickley and Brad Fischer enjoying tea, Sarah Rose Stiles pouring a cognac into a glass with contact microphones, projection of slides “relevant to Thoreau” behind a theatrical performance, a graphical score directing the pressing of keys on an amplified manual typewriter (performed by Eric Theise), and the use of the text from that typewriter in another song. There was also a large orange stuffed fish on a table. I continue to work through the backlog of art and music reviews by presenting some of the openings and performances I saw on the particularly busy and fun evening of February 19 here in San Francisco. Although the evening included both musical performances and exhibitions of visual art, music was present as a central theme throughout. 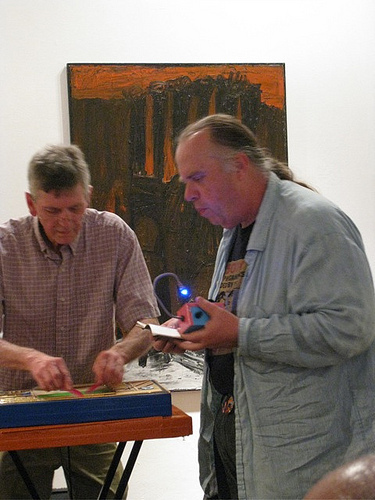 First up, we visited Jancar Jones Gallery for the opening of William Leavitt: A Show of Cards. 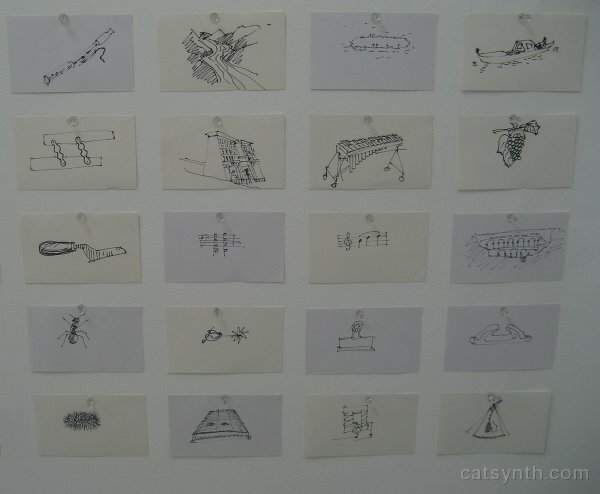 The exhibition featured “over 300 ink drawings on index cards” (though I only counted 248) arranged in three groups on the walls of the gallery. 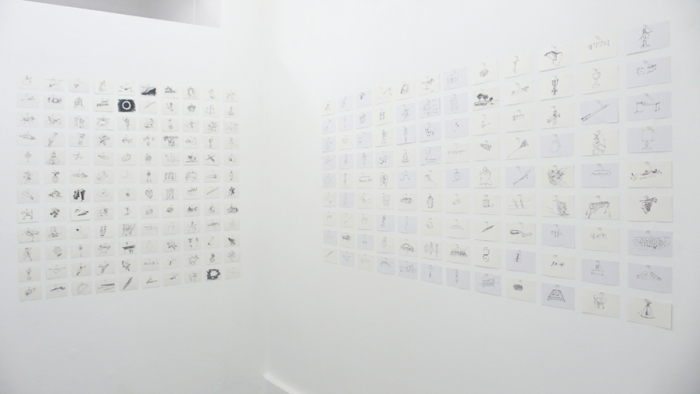 The gallery’s stark white walls presented a great surface for drawings, which were sometimes very sparse and sometimes quite detailed. Many featured musical elements, such as instruments or notes on a staff. There were also mathematical pieces (such as an x-y plot of a sine function), electronic circuit diagrams, architectural drawings, animals and abstract textures. It was fun to scan the rows of cards, picking out individual ones for closer inspection and comparison, particular the abstracts and the references to some of my own areas of expertise (e.g., music and electronics). It turns out Leavitt has a long-standing interest in electronic music, and was featured in this article at GetLoFi alongside circuit-bending godfather Reed Ghazala. 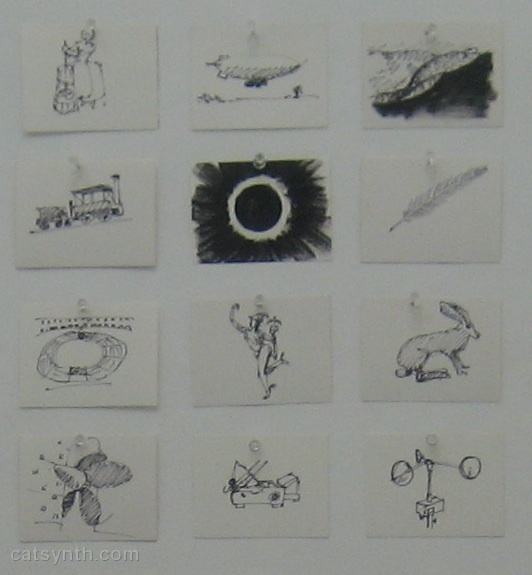 In addition to being works of art in their own right, the cards serve as a source material for chance procedures that Leavitt uses in other works. 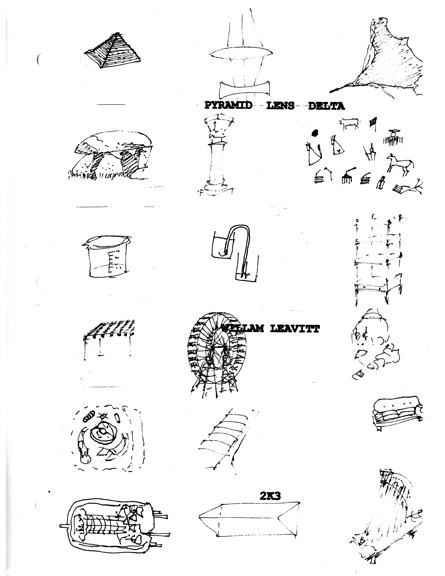 In particular, a random subset of cards were used to generate a narrative that was incorporated into the text for his play “Pyramid Lens Delta” (the title came from the first three cards in the set). The script for the play was part of the exhibition. The back of the script contained the card set, and glancing through the text one could see where portions of the dialogue seemed to be drawn from the cards, particularly dialogue associated with Ivan, one of the characters in the play. 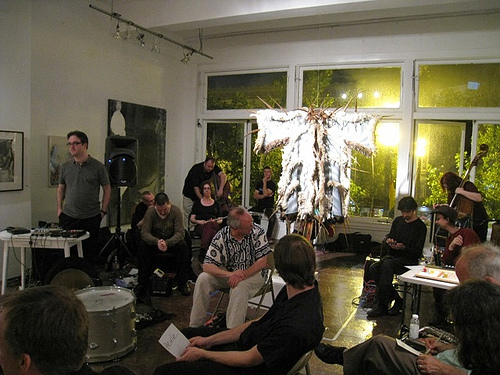 Leavitt has used chance processes for past works, including a theater piece The Radio which premiered in 2002. This piece includes not only dialogue but also an original score that included musique concrete. I would have liked to have seen this. After Jancar Jones, we made a brief detour into that ambiguously defined area at the base of Potrero Hill to Project One for The Art of Noise, a visual exhibition coincident with the Noise Pop Festival. It featured large artistically altered portraits of well known musicians, as well as some installations, such Ted Riederer’s piece featuring drums covered in rose petals. We finally ended up in the Mission District, and after a brief stop for tacos arrived at Bluesix for a pair of musical performances. The saxophone duo of David Boyce and Phillip Greenlief. As noted in previous reviews, Greenlief’s virtuosic saxophone performances cover a wide variety of instrumental techniques. The duo weaved effortlessly between idiomatic jazz riffs and more free-form sections featuring multiphonics, noise production and vocals. The change between sections was both sudden and subtle; I was immersed in a jazz riff with long up-and-down lines or rhythmic patterns and only later would realize that we had moved to a more non-tonal (i.e., “noisy”) and arhythmic section. They demonstrate that these modes of music making need not be at odds (as they are sometimes portrayed on musician discussion lists) and can be part of a single piece of music. The performance did, however, inspire a short discussion with a friend about what is “experimental music” and why the performances this evening did or did not qualify as “experimental”. Boyce and Greenlief were followed by the Karl Evangelista Spaceman Explorer Trio, featuring Karl Evangelista on guitar, Cory Wright on baritone sax, and Jordan Glenn on drums. Evangelista in his various groups blends jazz traditions with elements of late-20th-century experimental music. This of course led back to the question of whether or not this performance was “experimental”, particularly given strong jazz foundations on the pieces that we heard. The trio opened with loud driving rhythms and Evangelista and Wright trading long fast melodic runs. The piece “Hurdles” on Evangelista’s MySpace is quite representative. Another piece a somewhat slower groove with strong quarter notes (one might say a little bit “funkier”, more 1970s). Within this context, the melodies, riffs and one-off notes were often atonal, which helps to keep things moving forward. Overall, it was a fast-paced and virtuosic performance. Last Thursday, I found myself back at my old “stomping ground”, the Center for New Music and Audio Technologies (CNMAT) to hear an evening of improvised music. Dieb31 was then joined by Tom Djll (trumpet and electronics), Philip Greenlief (saxophone), Gino Robair (percussion and electronics) and Kenn Ueno (extended vocal techniques). The set began with “scraping sounds”, Robair blowing a small horn against a drum and Greenlief scraping a mouthpiece cover along his tenor sax. 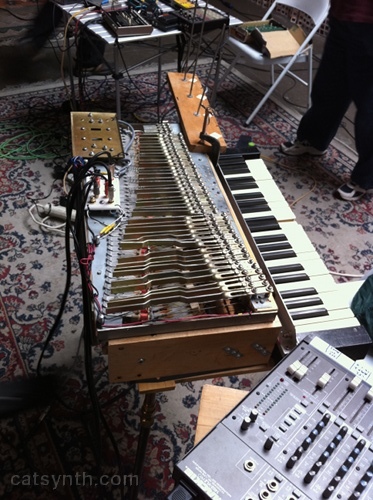 Indeed, the acoustic instruments as noise sources dominated the first section of this extended improvisation, before the Blippo Box, the other electronic instruments and Dieb31’s turntables entered. It was interesting to hear how the sounds from the turntables an Ueno’s vocal techniques matched the acoustic instruments, and it was a challenge at times to tell which sounds were acoustic and which sounds were electronic. Another notable confluence was Ueno’s throat singing set against low-frequency sounds from the turntable and the Blippo Box. There were also contrasting sections with percussive short notes on all the instruments (trumpet, electronics, sax, voice, turntable, percussion) in rapid succession. There was a very soft section with saxophone multiphonics (we have commented on Greenlief’s expertise with multiphonics in the past), vocal whispers, low-level electrical sounds, and a resonant tube; and very loud moments, screeching, high-pitched. One very rhythmic section featured Gino running fan against cymbals and Tom Dill running a similar fan against his trumpet. Greenlief joined in running keys against his sax. The piece ended with loud notes that came to a sudden stop. This was followed by a much shorter “encore” improvisation, whose memorable moments were the variety of sounds from the turntable, which included an excerpt from a bebop recording and a toilet flushing.